ABM Mechanical can design, install and service all types of commercial heating, ventilation and air conditioning or HVAC Systems such as central heating, hydronic, radiant, ducted or ductless, air to air, water or ground source heat pump, solar and geothermal systems including components such as baseboard, heat piping, pumps, unit heaters, AHU or air handling units, VAV or variable air volume terminal units, boilers, humidifiers, heat exchangers, temperature controls, cooling towers, chillers, heat pumps and glycol to water systems. We specialize in commercial or industrial new construction or renovation projects for industries such as hospital and healthcare, college and university, laboratory and medical research, aquaculture, retail, multi-unit housing, as well as industrial and government. Our team provides the capacity to accommodate designing and installing HVAC technology that maximizes cost effectiveness and functional utility for the complex variables that exist in systems to regulate the inside atmosphere with respect to temperature and humidity, using fresh air from outdoors. ABM Mechanical can advise, design, install and service central heating systems with hydronic, air or air over water systems. Geothermal technology is gathering momentum as a cost effective way to minimize the operating costs and fuel consumption for generating heat in the colder months. Heat pumps are becoming much more popular in the last decade. They provide efficient and flexible design options and can extract heat from the air or ground. Although the initial investment for a heat pump system tends to be greater, the long term cost and payback makes this investment well worth the upfront cost. Our Professional Technicians hold required licenses from the State of Maine for propane, natural gas, oil and solid fuels. In addition, we meet or exceed OSHA safety regulations during all work. Safety for our technicians is a priority. All employees are required to complete the OSHA 10 Hour Course. Foreman, Project Managers and other key employees are required to have the OSHA 30 Hour Training Certification. All employees are encouraged to maintain a First Aid Certification. Every HVAC System must be properly designed by competent Engineers or HVAC Design Professionals. An efficient cooling and heating system relies on it. 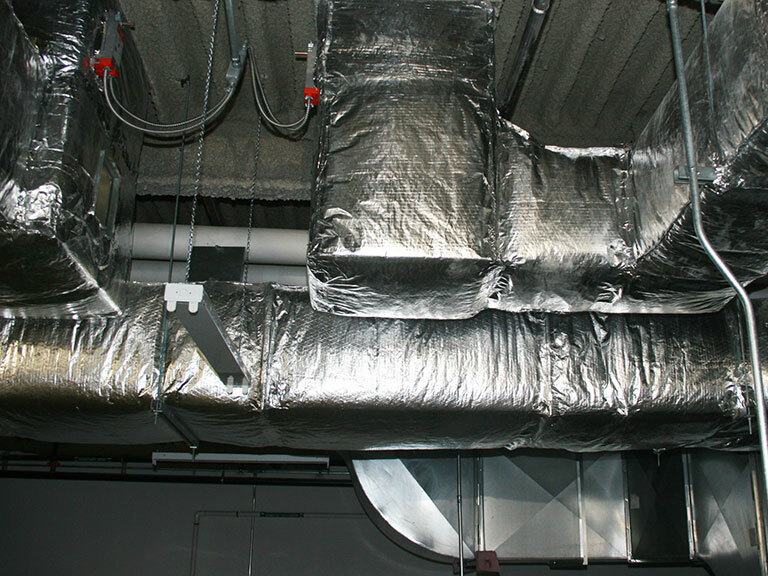 A ventilation system that runs efficiently will use less energy and save fuel costs. It is also the basis for ultimate comfort in your building facility. 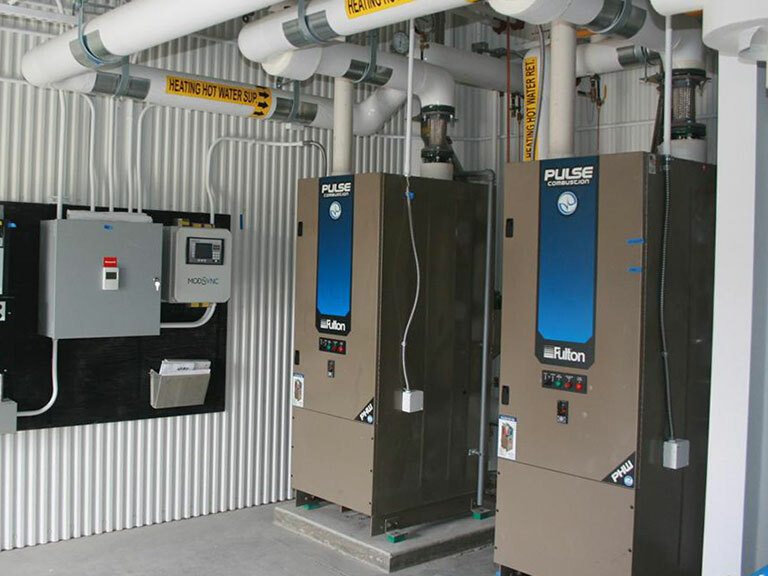 Many of our systems are designed with equipment using an energy recovery system to help reduce the amount of heat and cooling that would otherwise be lost to the outside air. This recovery system consists of an energy conservation wheel that is a rotary counter flow air-to-air exchanger designed to provide maximum energy efficiency in ventilated systems where heated or cooled air is exhausted and outdoor air is introduced as makeup. This wheel allows ventilation systems to be sized with smaller compressors, condensers, and other components, reducing the initial cost of the system. Not only is it more cost effective, but also more environmentally sound by reducing energy consumption and combustion. 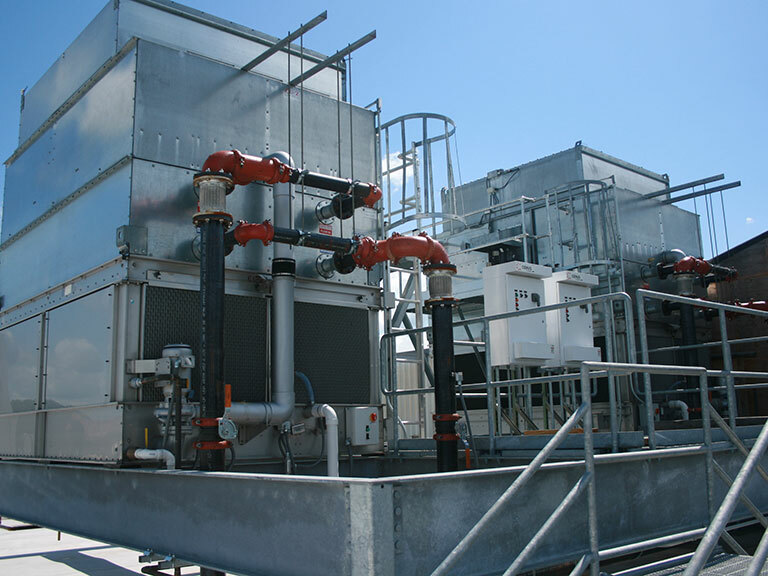 Cooling systems for commercial, industrial and institutional building structures can range in complexity from a one ton simple concept system using a heat pump to transfer heat and thus create cooling in a desired space, to a four hundred (400) ton roof mounted system that can condition air for large building spaces. Closed-loop modular systems provide expansion flexibility and should be considered for any project where additional capacity may be necessary.